The Lowe’s site on Ninth in Albany was still awaiting construction Friday. 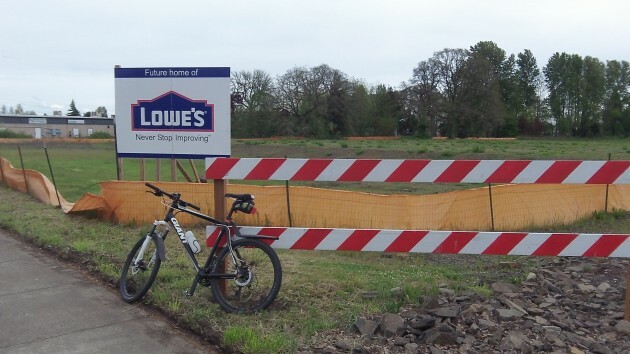 It’s been about two months since Lowe’s filed for building permits for its planned Albany home improvement and garden center at Ninth Avenue and Oak, and city officials say the company likely will be cleared to start construction any day now. Under a revised development agreement with the city signed in January, Lowe’s must open the 125,000-square-foot store by the end of 2015 or start paying damages. That gives it eight months, and I was wondering what the holdup was. The city of Albany has paid almost $4.5 million of the $5.2 million in Oak Street improvements needed for the Lowe’s project, including punching Oak through to Pacific, and the company will be assessed $750,141. Lowe’s has agreed to pay its assessment in a lump sum rather than over time.